"We're in a good atmosphere as we're on a winning streak," Seo said at a press conference at Suwon World Cup Stadium. "Our players are in good form." Suwon surrendered a two-goal lead to suffer a painful 3-2 loss in the first leg in Japan. A win with a two-goal margin will secure Suwon's spot in the final. Suwon can also advance to the final with a 1-0 win or a 2-1 win thanks to the away goals rule, but a 3-2 win will force the two teams into extra time or even a penalty shootout. "We need to be more careful tomorrow and had to give our everything," he said. "We'll put our emphasis on attack and will try to control the midfield." Suwon have been showing solid form in the domestic league since their defeat to Kashima on Oct. 4. They beat Sangju Sangmu 2-1 away from home on Oct. 7 and edged out Jeju United on penalties after a 2-2 draw at the Korea Football Association Cup quarterfinals Wednesday. Suwon then blanked Pohang Steelers 2-0 at home Saturday in their K League 1 campaign to stay in fourth place in the league table. "I told our players to forget past victories," he said. "We need to be cold-hearted on the pitch and need to play intensively. I hope many fans can support us tomorrow." Seo returned to Suwon's helm on Oct. 15, just 48 days after he quit the job. 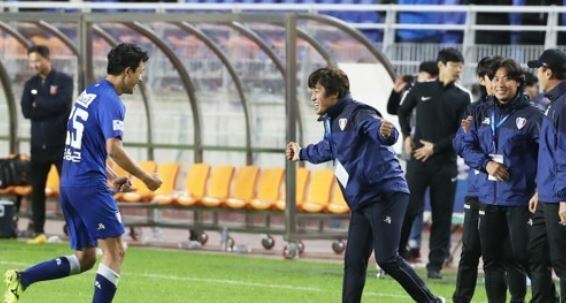 In the ACL semifinal first leg against Kashima, Suwon were managed by caretaker Lee Byung-keun. Seo said the players appeared to be more motivated after his return. "I think our squad became more stable," he said. "Our players are also playing with more confidence." Suwon suffered a 2-1 loss to Kashima at home when the two sides met in the group stage. Seo said that the two teams will play an intensive match.